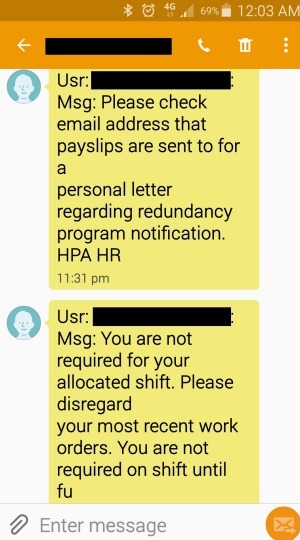 Forty-one workers at Hutchison Ports Australia’s Brisbane operations at Fisherman Island were sacked by text message just before midnight, Thursday 6 August 2015. More than 100 workers across the country were sacked this same way. Maritime Union of Australia Queensland State Secretary Bob Carnegie said he believed the company was attempting to de-unionise the ports and the remaining workers in Brisbane were staging a “sit-down occupation” in protest of the sackings. The MUA have set up a camp at the site, which includes the ETU van and a roster to ensure that there is a presence 24/7. These workers would appreciate a visit from fellow travellers at any time of the day or night. The address is: Berth 11 Curlew Street located at the Port of Brisbane, Fisherman Island.